Fun and flirty, this short strapless homecoming dress from the designers at Alyce is ideal for hoco 2019, a sweet-sixteen party, or a family celebration. 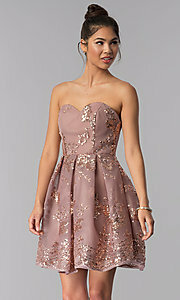 Splashed with patterns of swirling sequins, the semi-formal party dress provides just the right amount of sparkle. 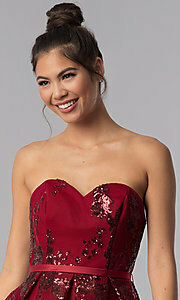 Maintaining a youthful vibe, the strapless bodice features a charming sweetheart neckline and open back. A satin band defines the natural waistline while adding a touch of elegance to the sequin-mesh short homecoming dress. Featuring wide volumizing box pleats and satin and tulle trimmed linings, the short a-line skirt of this strapless party dress works to beautifully accentuate a shapely feminine silhouette. 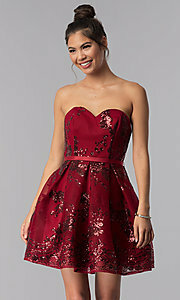 Step out in style when you slip into this unique sequin-mesh homecoming party dress by Alyce.